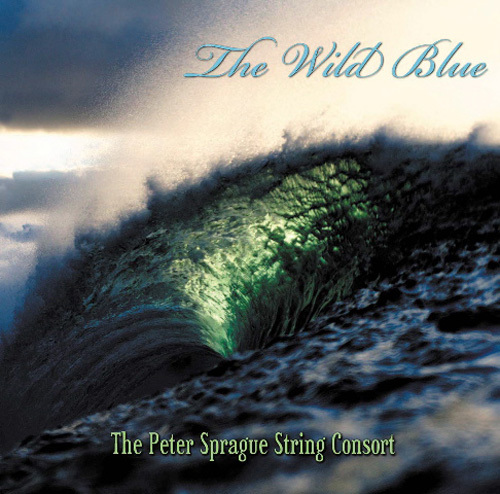 The Peter Sprague String Consort is a gathering of two different worlds — a group comprised of a classical string quartet and a jazz trio. The two worlds come together to explore a soundscape rich in harmony riding on the rhythmic pulse of the Brazilian samba and jazz swing. Peter is the main composer for the group but the band also plays a few pieces written by Chick Corea and also a new arrangement of Bach’s “Prelude No. 9” from the Well Tempered Clavier. If you’ve never heard the sound of 26 strings and 3 cymbals resonating together inside the world of jazz dancing with classical, then open your ears to this new aural experience. When I was 20 years old and in the late 70’s, pianist Butch Lacy had a group in San Diego that was made up of a string quartet along with bass, drums, Butch on piano, and myself on guitar. 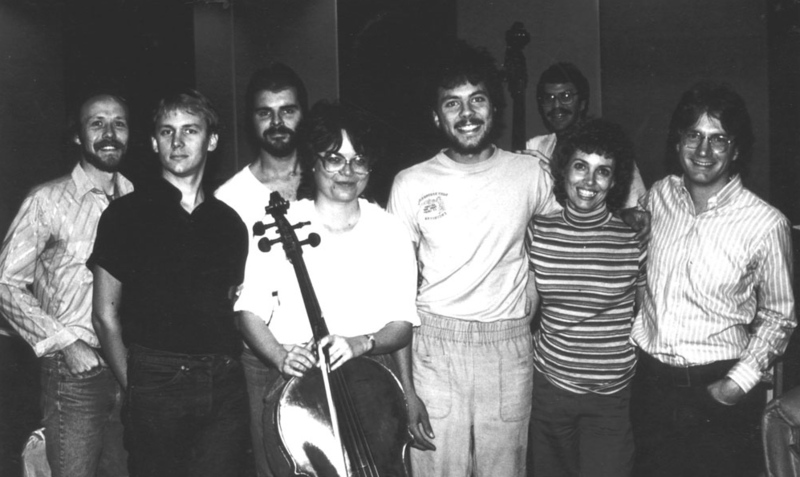 Butch wrote the music and with this group came my first experience playing with string players in a chamber music setting. I loved the blend and I dug the possibilities of this instrumentation. In the mid 1980’s after hearing Chick Corea’s group with Gary Burton and a string quartet, I decided to explore this style of music through creating a group of my own. I took off some time to compose and eventually came up with a body of music. 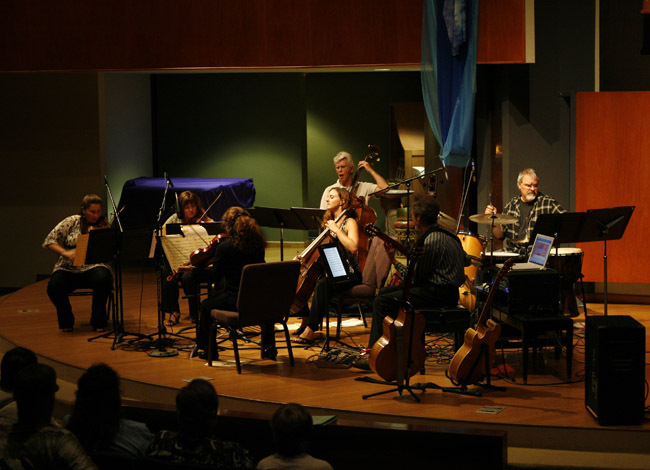 The first incarnation of the group included Mary Karo and Randy Brinton on violins, John Stubbs on viola, Mary Lindbloom on cello along with Bob Magnusson on bass, Duncan Moore on drums, and myself on guitar. Here is a photo of the early group at a recording session. Left to right – John Archer, John Stubbs, Duncan Moore, Mary Lindbloom, Peter Sprague, Mary Karo, Randy Brinton, and Bob Magnusson in back. We played with this group on and off for a couple of years and then we went under the radar until a 1990 show at Cal State San Marcos. The group was basically the same except Hernan Constantino replaced Mary Karo, Kevin Hennessey replaced Bob Magnusson and Ron Wagner replaced Duncan Moore. After the concert we recorded my composition “Amadeus” for my Soliloquy recording. This leads us to the current band. Duncan and Bob are back in the group along with an exciting new string quartet led by violinist Bridget Dolkas. I’m thrilled with the way the Consort sounds and I’m inspired to keep the revolution alive. Here is the cover to our first recording called The Wild Blue. 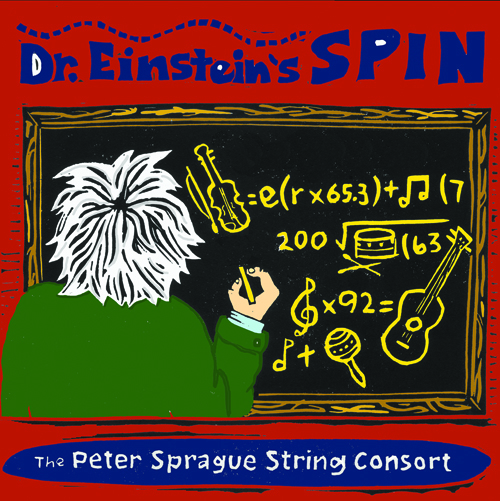 Our second recording project is called Dr. Einstein’s Spin. Since the 2009 release of The Wild Blue we’ve played a lot of concerts and the band continues to evolve. Things further improved when I was awarded the prestigious 2010 New Jazz Works grant from Chamber Music America. This set the stage for me to compose a new major work, which led into playing several concerts of the new piece and culminated in the release of the new CD. With his thirty plus years as a professional musician, Peter Sprague has evolved into a musical powerhouse, having produced and or played on over 190 recordings. 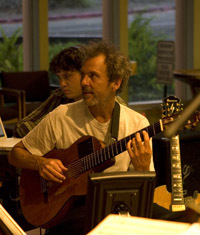 He has published eleven songbooks of his own music, including The Peter Sprague Guitar Technique which is required study at Grossmont College. In addition to writing his own material, Peter has transcribed 6 songbooks for Chick Corea, holds the title as Chick’s official transcriber, and was the only musician entrusted as the arranger for Chick’s legendary song Spain for the first GRP All Star Band recording. of 2000 Poll; Best Mainstream Jazz Artist – San Diego Music Awards 2000; Best Jazz Artist – San Diego Reader’s Best of 2003 Poll, and most recently he won Best Jazz at the 2004 San Diego Music Awards and Best Jazz Artist at the 2007 San Diego Music Awards.Though it is true Peter Sprague is a local phenomenon, make no mistake about it, he is a world class talent. Peter has played with such greats as; Art Pepper, Dianne Reeves, Hubert Laws, Chick Corea, Alfonse Mouzon, Al Jarreau, Joe Farrell, John Pattuttuci, Mitch Foreman, Ray Brown, John Klemmer, Eddie Harris, Stanley Clarke, Eric Mariental, Joe Pass, Sergio Mendez, Kevyn Lettau, David Benoit, Peter Erskine, Bob Mintzer, Alex Acuna, and Charlie Haden. (The full list and discography appear on Peter’s website).A variety of artists come to his recording facility Spragueland, to take advantage of Peter’s excellent producing and engineering talents. The studio has a reputation for delivering distinctively crisp and well balanced recordings, always impeccably tailored to the music. Peter Sprague CD’s have been produced there since 1994. A generous musician who frequently showcases new talent, Peter always makes sure to boaster his accompaniment, and can often be found playing his heart out for worthy causes such as supporting the music program at his Alma Mater, San Dieguito Academy. In September 2004, Peter released the CD Friends to benefit the Escondido Humane Society. Though Peter’s roots are deep in bebop and Brazilian rhythms, he is prolific in many styles of music. His twenty minute piece, “Concerto for Two Guitars and Orchestra”was well received when he performed it live with the San Diego Symphony Orchestra in 2000. The program was called “Local Living Legends” which featured Peter Sprague and Grammy award winning Violinist, Mark O’Connor. 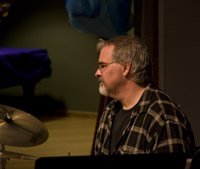 Whether exploring new territories of his original jazz music or revisiting popular tunes by beloved artists like the Beatles, Bob Marley, Cole Porter, and Charlie Parker, Peter Sprague’s unique blend of inspired melodies and brilliant technical execution consistently enthuse and challenge the listener. You are again invited to take part in the relentless unfolding musicality of a special person, Peter Sprague. Bob Magnusson is an active performer and music educator. His credits include working extensively with the Buddy Rich Band, Sarah Vaughan, Art Pepper, Benny Golson, Joe Farrell, Laurindo Almeida and Bud Shank, to name a few. 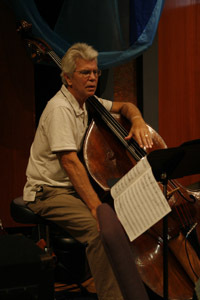 He also has been a member of the San Diego Symphony and has worked with various pop artists such as Linda Ronstadt and Natalie Cole.He wrote “The Art of Walking Bass”, published by Hal Leonard in 1999. He is currently on the faculty of San Diego Mesa College and Point Loma Nazarene University. Duncan Moore attended the University of Iowa in 1973-1977, where he was a music major. He has performed with Joe Farrell, Conti Condoli, Mark Murphy, Hal Crook, Mose Allison, Art Neville, Carmen Bradford, Ray Brown, Sal Nestico,Tom Scott, Steve Kujala, Paul Horn, Buddy Collette, Bobby Shew and Rickie Lee Jones to name just a few of the diverse players and styles he has in his repertoire. He has performed on numerous national jingles and movie soundtracks. He has recorded extensively for the national Disney on Ice shows. Duncan has taught privately and at San Diego State University. He has also been the guest artist and lecturer at many jazz camps and clinics for schools and various Universities. 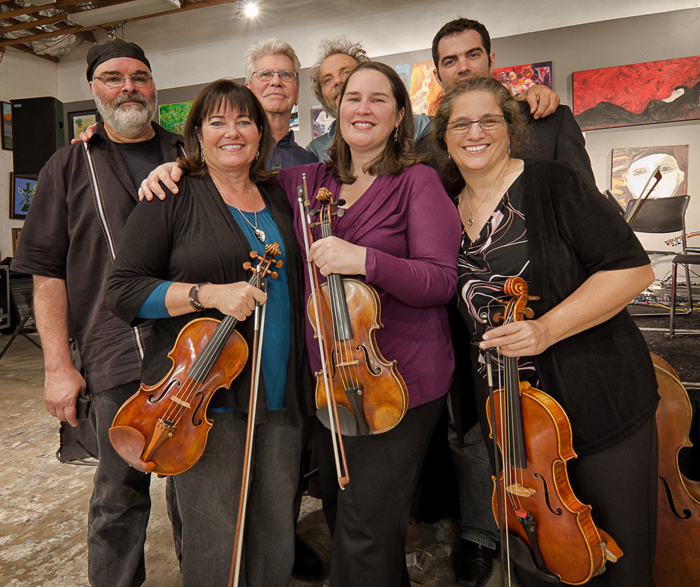 Bridget Dolkas, first violinist of the California Quartet, is a vibrant member of the musical community in Southern California. She is the Principal Second Violinist of the Pacific Symphony, and frequently performs on the orchestra’s popular chamber music series, Cafe Ludwig. In addition, she performed for eight years as a member of the San Diego Symphony and the San Diego Opera Orchestra. With the California Quartet, Ms. Dolkas has been invited to perform in Europe and across the United States. She has won First Place in the La Jolla Symphony Young Artist Concerto Competition and the Meadowmount Mozart Concerto Competition, as well as Finalist in the UCLA Concerto Competition. Her varied musical background has led to interesting and diverse performance opportunities, including concerts with fiddler Mark O’Connor, chamber performances at La Jolla Summerfest, electric fiddle solos with the Pacific Symphony, and an appearance in an MTV video. As a student of Alice Schoenfeld, she earned her BM degree at the University of Southern California and also received the award for Chamber Musician of the Year. Ms. Dolkas continued her studies with Isaac Malkin and completed an MM degree from the Manhattan School of Music. She is currently a Doctoral candidate at UCLA where she studied with Mark Kaplan. Ms. Dolkas performs on a 1798 Lupot violin that is on loan through the Pacific Symphony. 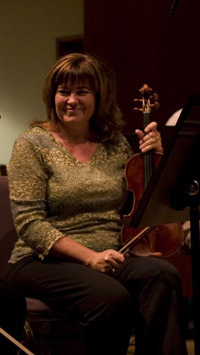 Jeanne Skrocki, second violinist of the California Quartet, is Concertmaster of the Opera Pacific orchestra and the Assistant Concertmaster of the Pacific Symphony Orchestra. A native of Los Angeles, she began her musical training with her mother, Bonnie Bell, and then studied with Manuel Compinsky of the famed Compinsky Trio. Her first solo appearance with an orchestra was at age ten, and as a young soloist she received numerous first place honors and awards. At seventeen, Jeanne was awarded a full scholarship to study with the legendary Jascha Heifetz in his Master Class at the University of Southern California. Jeanne is a busy chamber musician and has the distinction of having won first prize in the Coleman Chamber Music Competition as a violinist and as a pianist. In addition to the California Quartet, she is a founding member of Les Amis Musicalles, an award-winning flute, violin and viola trio. Their debut CD, Beyond Beethoven; 20th Century Chamber Music, has received outstanding reviews worldwide. Jeanne has also recorded with the Pacific Symphony Orchestra and on numerous motion picture soundtracks. Recent highlights include working with Itzhak Perlman and Yo-Yo Ma on John Williams’ score for the movie Memoirs of a Geisha and with Hilary Hahn on James Newton Howard’s score for The Village. She has also appeared on television during the Grammy Awards, the Emmy Awards, and the Jay Leno Show. As a teacher, Jeanne particularly enjoys working with young musicians and has been on the faculty of the Redlands Community School of Music’s Summer Music Workshop since 2001. 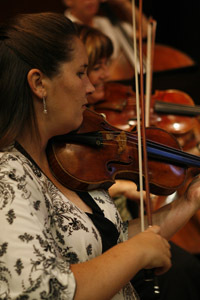 She also keeps busy home-schooling and practicing with her daughter, Laura, an aspiring young violinist. 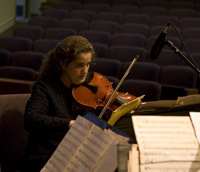 Pam Jacobson, violist, performs as a freelance violinist and violist with the Pacific Symphony, Opera Pacific, the Cabrillo Festival of Contemporary Music, and with various chamber ensembles in southern California. She has performed with the Fresno Philharmonic and the Long Beach Symphony and toured extensively with Yanni. Ms. Jacobsen received her Bachelors in Music from Chapman University, and has studied with Ann Thatcher and Robert Becker. In addition, she has recorded for the motion picture industry in Los Angeles. 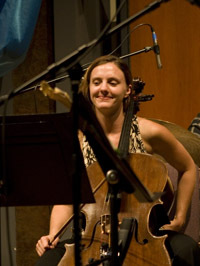 Carter Dewberry, cellist, completed her DMA in Chamber Music Performance from UCLA in December, 2005. She received her MM in Cello Performance from UCLA in June, 2002 and her B.M. in Cello Performance from Western Michigan University in April, 1998. She also holds a B.A. in French with a minor in Women’s Studies and Philosophy. Ms. Dewberry has a wide variety of performance experience. As soloist, she has performed the Elgar Cello Concerto with the San Fernando Valley Symphony and the Dvorak Cello Concerto with the Battle Creek Symphony (in Michigan), and the Western Michigan University Symphony. She has over ten years of experience playing in professional orchestras, including the Riverside, San Fernando, Kalamazoo, Grand Rapids and Battle Creek symphonies. And, she has performed as part of the orchestra on film scores from Xmen II to Pumpkin to Gothika. Ms. Dewberry’s passion, however, is chamber music performance. Ms. Dewberry is currently in the band Red Velvet, a cross-genre duo that performs a wide range of music, from sensual tangos to sweet jazz ballads to groove-based experimental compositions. She is also performer, Director and Founder of The Definiens Project, whose mission is to redefine chamber music in a contemporary context.